After the extensive national media attention the men’s basketball team received during its NCAA Tournament appearance, major companies are jumping to scoop up endorsement deals with the now high-profile players. Local vendors have ordered hundreds of extra copies to pleasure a campus hungry for images of a scantily clad KanFreakYa posing on an examination table. 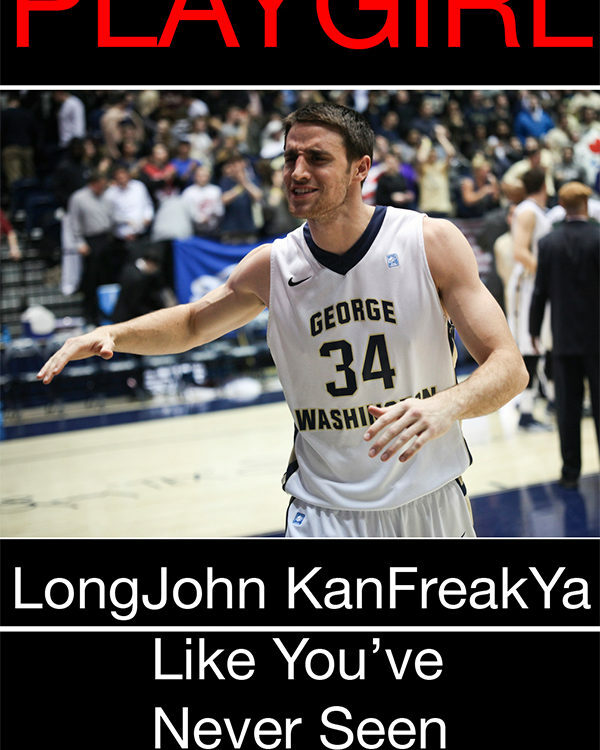 KanFreakYa averaged 12 minutes per game for the Colonials this season, but ladies know he can do much better than that off the court. Experts warn it’ll be best to keep a stethoscope on hand, as heart rates will most likely be escalating. The news was a disappointment to Colonials big man Heaven Larsten, who thought he was a lock for the six-page spread after an early season photo shoot for the Hatchet showcased his physical transformation during the offseason. In tamer on-court endorsements, the team will be forfeiting its long-term contract with Nike in favor of a more user-friendly brand. Following the infamous “shoe-lace incident” of November 2013 involving men’s basketball freshman forward Corner-trey Beige, GW has signed a deal with New Balance for a five-year velcro-shoe contract. New Balance, the unquestioned leader in the velcro shoe market, has created a customized buff and blue shoe for the Colonials, complete with an engraved #RaiseHigh on the shoe’s heel. The partnership is the first of its kind for any team in any sport at any level – that is, if you don’t count the similar deal made by Saint Cecilia’s middle school in Arlington, Va.
“We always want to make sure we are first, and that we are promoting our brand wherever possible,” athletic director Robert DaNero said. Some players, though, are not very pleased with the uniform decision, as they do not want to be seen by the tens of millions of RaiseHigh TV viewers in bleached-white kicks. For Beige, however, it’s a dream come true after the traumatizing on-court experience that has left him with the shoe-tying yips.